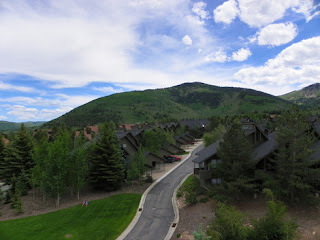 Yes, I realize that Evo was nearly a month ago and I haven't really blogged much since then. Family issues, summer doldrums, running behind. You know the drill. Anyway, it's hard to express just how great Evo was, both as a social event and as an inspirational, learning experience. I was lucky enough to win a paid registration via Clever Girls Collective and shared a room with pals old and new from Collective Bias, which made it a more affordable (and fun!) trip. "The connection that can only happen when we let go of who we think we're supposed to be and embrace who we are." This slide was part of the closing talk with Karen Walrond and Brené Brown. They spoke about living authentically, online and off, and I really think that it summed up the whole conference beautifully. I wanted them to speak for much, much longer. What I took away from their talk: be who you are, appreciate yourself and those around you, enjoy what you do and it comes back to you. The Lisa Leonard necklaces that were at our place settings at the opening keynote are stamped with a flower and the words "dream●grow●evolve" which made an apt motto for the whole conference. Never have I been surrounded by so many women with such an overflowing sense of positivity. Seriously, I did not witness one instance of drama for the whole long weekend. It was breathtaking, as were the lovely mountains of Park City. I got to spend a lot of time with my Collective Bias friends, as I mentioned, but I didn't end up taking many pictures. Thankfully, everyone else seemed to be toting impressive cameras! Sandy Jenney managed to be everywhere during the conference AND still post her pics and videos instantly, proving that she does indeed have mad organizational skills. We were the early birds, arriving on Wednesday morning, so we got to take the cabriolet down the mountain to the Farmer's Market. It was great to spend time with old friends and meet so many new friends in person, way too many to list here. I wish I'd taken more photos of everyone. (As a sidenote, Karen Walrond has made me vow to be less camera shy. I hate being photographed but I am trying to squelch the urge to run and hide whenever I see a camera. Yes, you are welcome to hold me to that at BlogHer next month.) It felt good to be around such a diverse and vibrant group of women. And the handful of men who braved the estrogen fest! There was some celebrity spotting, too. 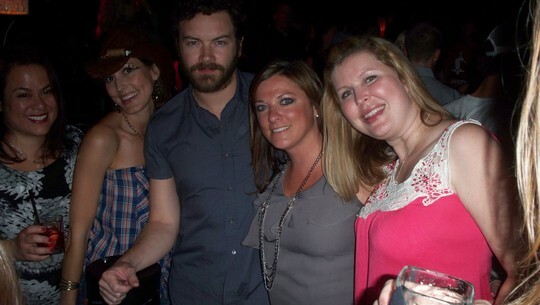 Danny Masterson a.k.a. DJ Mom Jeans played at the local bar he owns (photo courtesy of the indefatigable Kadi Prescott) and the adorable and talented UKOne Eskimo performed acoustically and plugged in at Evo. 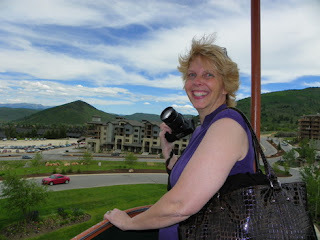 This last picture was taken at the closing party at Park City Mountain Resort after I rode the alpine coaster. It was an amazing experience but I felt like I was cheating on my kids, seeing all the locals with their kiddos, taking advantage of the zipline and slide. It was unfathomably gorgeous. Next year, I hope to bring the whole family to Evo '11 so they can share in the experience. That looked so fun and relaxing. I totally want to go next year! And you'll have to give me the skinny (pun intended) on the Yummie Tummie.